ID Card Ribbons, Clear Protective DuraGard Laminate, coverage: Full card, 1.0 mil thickness for protection, Yields 300 application prints. Compatible with SD460. HDP Film, HDP Retransfer Film, 1,500 images. Requires a Fargo printer with reverse transfer print technology. The image is printed on to the film, which is then applied to the surface of the card. Compatible with HDP5000, Hdpii. This part is also known as 084053. I Series, 1 Mil Top Clear Laminate, 625 imprints per roll. The added layer of laminate protects your card from normal wear-and-tear on your printed cards, as well as extra protection from fading. Laminate must be used with a printer which has lamination capabilities. 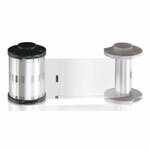 Compatible with ZXP Series 8 and ZXP Series 9 Printer. ID Card Ribbons, Clear Protective DuraGard Laminate, coverage: Full card. 0.5 mil thickness for protection, Yields 350 application prints. Compatible with SD460. ID Card Ribbons, DuraGard OptiSelect (TM) Laminate, coverage: Full card .6 mil protection from normal wear and tear. Includes a "Secure Globe" Security image for added security against counterfeit. Yields 350 application prints. Compatible with SD460. HDP5000, HDP Holographic Film, High Secure Orbit Design - Universal Orientation - 500 images. Note: For use on HDP5000 Series Printers only. Compatible for use with composite cards only. In the case of lamination, not for use with thermal transfer films.